Animals are one of Alexander's favourite things - he loves for us to read about animals, watch them on shows, as well as actually see them. We have a tree just behind our back garden that clusters of birds like to perch on and he can spend ages at the windowsill watching them. We tend to watch them from indoors because Alexander is no light foot and they tend to fly away when we go out the back. I'm not here to talk about birds however; I'm going to be sharing a book that features animals you'd commonly find in a zoo. Currently, Peep Inside The Zoo is one of Alexander's favourite books, we go through it more than once a day, honestly. It's funny because he loves this book but yet when we went to an actual zoo a couple of months back he wasn't so interested - it's amazing how much children's interests can change month to month. As the title suggests, there is no real story inside this book, it is more of a visit at the zoo - or peeping inside. There are a variety of animals featured, all doing various activities, with little snippets about the animal itself. You'll find lions, pandas, giraffes, elephants, penguins, monkeys, gorillas and more. Each page has an interactive element, but the focus is very much lifting of flaps, it adds to the 'peeping' aspect of the book. 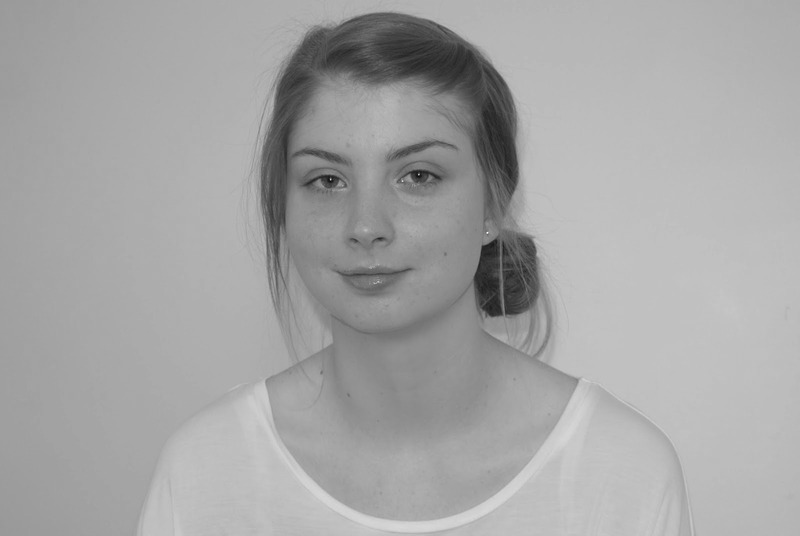 Below are a couple of images from the book, showcasing the beautiful artwork and creativeness of the books design. 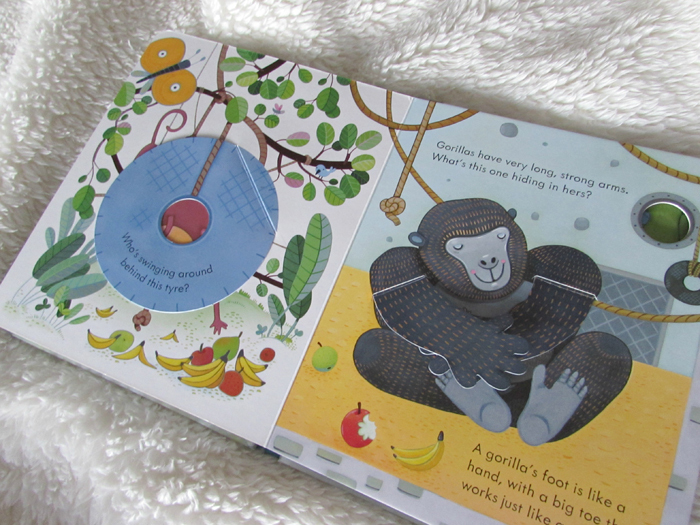 The two pages shared are favourites of ours - the butterfly page is my favourite, and the monkey and gorilla page Alexander's. If you look closely at the butterfly page, you'll see the a corner of the page has been munched by the caterpillar - I love details like that in a book. Peep Inside The Zoo is a more recent purchase of ours, but I see more of the 'Peep Inside' line being added to Alexander's collection over time. Alongside the zoo, the range also carries - Dinosaurs, The Castle, The Garden, The Farm, Night Time and Animal Homes. I think the concept behind these books is really great, educating a little one whilst remaining fun. 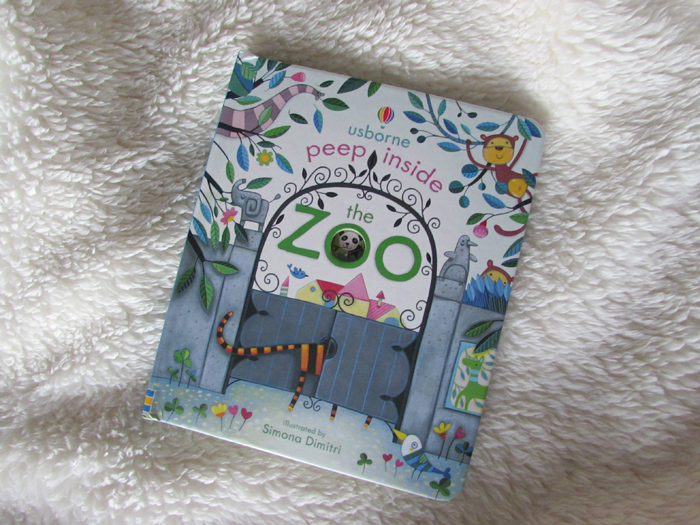 The 'Peep Inside' collection is perfect for little hands - children from 18 months upwards - but Usborne have extended the concept further by having two other similar lines - 'Look Inside' for children aged 4+ and 'See Inside' aimed at those over the age of 6. 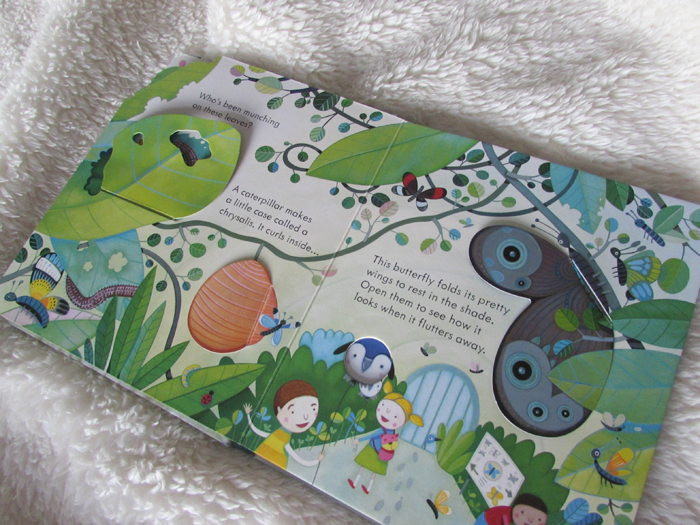 Love the look of this little book - such wonderful illustrations and so tactile! Thanks for your comment on my book haul post. Maybe 2016 will be the year we both discover Ali Smith's genius!! The illustrations are what attracted me to this book for the little one. Haha! Hopefully, I'm going to see if my local library has any of her books when I next reserve some books. Oh, that book looks so fun, and what a treat for the young ones to see all the catching illustrations. I love the artwork, I can see why Alexander likes the book so much. Thanks for sharing. I love the artwork in this book too - it's what caught my eye in purchasing it. I'm forever admiring the illustrations in children's books. I loved Usborne books when the kids were little. They were our favorites. This one is adorable! FYI: If you review a lot of children's books, feel free to link up with Booking Mama on Saturdays with her Kid Konnection feature. http://www.bookingmama.net/search/label/Kid%20Konnection We'd love to have more bloggers linking up! I can see why they were a favourite.